An ideal general contrast filter for black and white photography, the 37mm Orange 21 Filter from Formatt-Hitech helps to increase contrast when working outdoors by darkening purples, greens, and other cool tones. The orange of the color also results in lightening oranges, yellows, reds, and other warm tones, in order to produce a more naturally appearing outdoor scene, and offers increased cloud definition with reduced atmospheric haze for improved clarity. 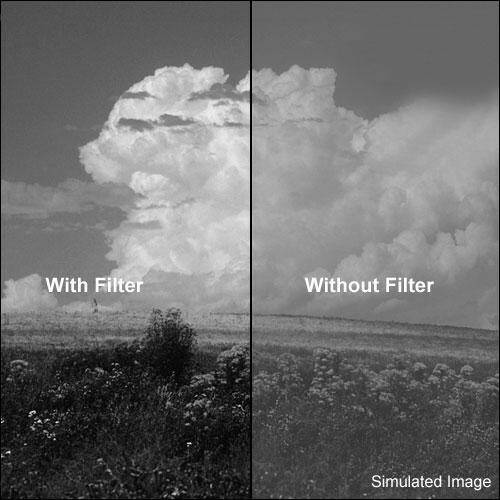 Standard orange filter provides the same effect as a Wratten 21 contrast filter, and helps to darken purple, blue, and green tones, while lightening warm orange, yellow, and red tones, when photographing in black and white. Helps to produce natural-looking clouds and works to clear distant light haze for a more accurate portrayal.